One of the reasons I love chairing post-show Q&As so much is the chance I get to learn new things from incredibly talented and knowledgeable panellists. Last night’s event for Jean Anouilh’s play The Orchestra at Omnibus Theatre was a special treat as the expert on hand was also an old friend of mine: award-winning director, composer, writer and, in this case, translator Jeremy Sams. Jean Anouilh (1910-1987) was one of the twentieth century’s most popular French dramatists. Best known for Antigone, his 1944 adaptation of Sophocles’ classic, Anouilh’s work ranged from high drama to absurdist farce. His other plays include Becket, The Lark, Romeo and Jeannette, The Rehearsal, The Lark and Ring Around the Moon. Decades ago, Jeremy translated The Orchestra from the original French, one of many plays of Anouilh’s that he’s translated. He was our ‘Anouilh bore’ on last night’s panel, but there was nothing the least bit boring about the insights. Amongst them: why has Anouilh been so rarely performed since his height of popularity in this country in 1962, when he had six plays running in London? It’s not just, as you might think, about falling out of fashion. Wrangling over the estate – Anouilh left his fortune to his wife and two mistresses, without telling them about each other – definitely complicated matters. 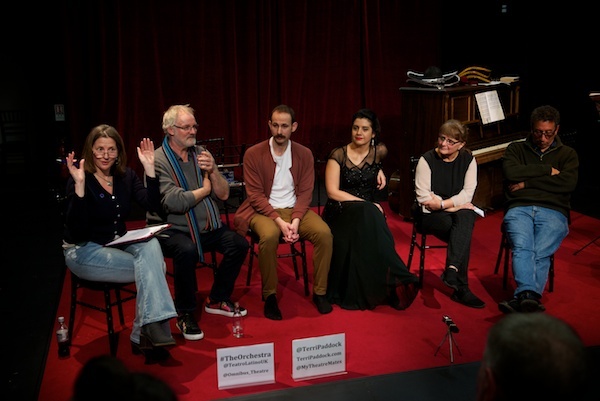 Lots of great discussion too about embracing diversity and internationalism, putting an accent on accents, life in France after the Nazis, synthesized orchestrations, musical miming and more – with input from the rest of the cast: Amanda Osborne, Sarah Waddell, Pedro Casarin, Luna Dai, Toph Enany and Jessica Hulme. The Orchestra continues at London’s Omnibus Theatre in Clapham until 17 February 2019.